Halloumi-graviera pull-aparts are individual filled bread placed next to each other and baked so that when baked they join into one large bread which can easily be separated by pulling each piece. When I saw this recipe at Choosy Beggars, I knew I would like it, since halloumi is a cheese indigenous to Cyprus, where I come from and which I adore and anything with halloumi in it would definitely be great. Halloumi is made from a mixture of goat’s and sheep milk, and it has a high melting point, and so it can easily be fried or grilled. Although Wikipedia says that halloumi resembles to mozarella, I totally disagree, as the two cheeses cannot compare. Tina’s recipe reminded me of a similar recipe we make in Cyprus, called halloumopita but which however, does not have any garlic in it and we do not add the olive oil on the dough but we add either shortening or margarine in the dough. We make these as big or small individual breads especially during Easter when we make flaounes. When grating the cheeses there are always some leftover bits and pieces of cheese which we mix into the dough. I still have a lot of recipes from Easter which I have not posted and hope to do this soon, so for the time being here is a glimpse of halloumopita. Back to Tina’s recipe. I did not follow Tina’s recipe exactly so instead of adding halloumi and mozarella, I preferred another Greek cheese, called graviera of Crete. Graviera of Crete is a traditional Greek cheese which is exclusively manufactured in Crete from ewe’s milk or mixtures with small quantities of goat’s milk. It is ripened for at least for 5 months and it has a slightly sweet taste and is harder than Graviera of Naxos, which is made with cow’s milk. Also, instead of adding parsley, I preferred to pair it with mint, as halloumi and mint pair perfectly together and did not use too much garlic. I did not have any nigella seeds so I sprinkled some fennel seeds and sesame seeds on top. Although I was reluctant to use the garlic, they turned out really good and we loved them. I have almost made these pull-aparts with graviera and feta (no garlic, no mint) with pepper and these are also amazing! In a medium sized bowl combine the flour, yeast, sugar, salt, olive oil and add water and knead until the dough does not stick on your hands or the bowl. When the dough is ready, cover it with the ¼ cup of olive oil and make sure it goes everywhere. Cover with cling film and a towel and allow to rise for about half an hour. In the meantime grate the cheese and add the mint and garlic and mix. Remove the dough from the bowl, knead and divide it into 20 – 25 equal parts, depending on how big you want them to be. There will be some oil left in the bowl, which do not discard. Using your fingers flatten each piece into a round disc about 10 cm (4 inches). Add a generous spoonful of cheese mixture. Gather up the sides of your dough circle, and pinch the top together to enclose the filling. Brush a baking tin with the leftover olive oil and invert the filled dough in the pan, closely next to each other. Brush with the remaining olive oil and sprinkle some fennel and sesame seeds on top. Cover with cling film and a clean towel and allow to rise again (about half an hour). Preheat oven to 180o C / 350o F and bake for about 30 – 35 minutes until golden brown on top. In the meantime grate the cheese and add the mint and garlic and mix. Remove the dough from the bowl, knead and divide it into 20 - 25 equal parts, depending on how big you want them to be. There will be some oil left in the bowl, which do not discard. Preheat oven to 180o C / 350o F and bake for about 30 - 35 minutes until golden brown on top. Resting time about half an hour to two hours, depening on the room temperature. Here is another version I made using halloumi and feta. The decoration above was made with a kitchen scissors, making small cuts around each bread. I am sending this recipe to Cinzia of Cindystar, who is hosting this months Bread Baking Day #19, Spring Country Breads. 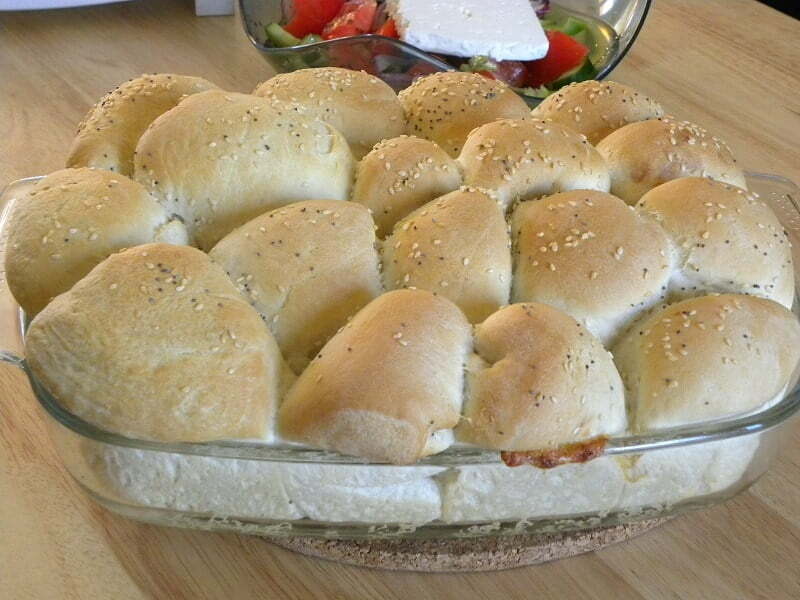 Instead of making pull-aparts you can also make cheese-filled bread rolls. I did not have any halloumi at home, so in this case I used feta, graviera, dried mint, pepper and added 2 eggs to the cheese mixture. On top I brushed them with olive oil and sprinkled some sesame seeds. I baked them in a convection oven to 180 degrees Centigrade, for 20 minutes. Wikipedia actually said that (mozzarella and Halloumi akin)? I remember Mike & Tina posting this…another fine use for Halloumi…an under-rated cheese but so delish. Ivy, these sound fabulous. I really like halloumi and enjoy seeing new ways to use it. And I agree, it is not at all like Mozzarella. Hallelujah for halloumi! Talk about good eats. This bread wouldn’t last 2 seconds. The only way homemade bread can be any better is if it’s filled with cheese! Yum yum yum. I can just imagine how soft and delicious these are Ivy! Beautiful! As a child, I lived in Cyprus with my parents, my father was in the RAF. So, I always remembered having halloumi, then I returned to Cyprus several times as an adult. I always gave my children different things to eat so they were used to halloumi too and they always called it squeeky cheese. We still have it on a regular basis because it’s so delicious especially when its melted on the bbq. I shall be trying this recipe very soon……. Hi Ivy,tThanks so much for participating! Your buns look wonderful and I have learned a lot about different cheese I had never heard before! Wow, Ivy! Those breads look so good! And I agree, having had, loved and enjoyed both mozzarella and halloumi, they are nothing alike, although I love them both! You will find the recipe in my cookbook "Mint, Cinnamon & Blossom Water, Flavours of Cyprus, Kopiaste! which will be published soon. Sorry for the inconvenience and thank you for your patience. I just made a batch of halloumi and can't wait to use some of it in this recipe. Thanks!